In 2005 presidential term limits were removed, and in 2017 the removal of the previous upper age limit of 75 was also announced. 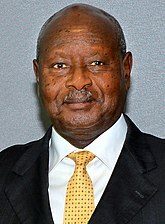 ↑ "Proposed Changes to Uganda's Presidential Age Limit Hit Roadblock". VOA. This page was last changed on 15 February 2019, at 16:53.